There were about 20 of us in the class and we were all housed somehow in Sheena’s large farmhouse. Saskia, Mickey & Thea’s college-aged daughter, cooked wonderful meals for us and we sometimes wandered into San Sano’s only restaurant for delicious dishes of pasta, roast wild boar and other local dishes. It was a perfect setting: we were on a fairly large Tuscan estate with a pool and several barns, which I imagine, dated back several centuries. We were on the edge of a large forrested area and I took many early morning walks where I saw deer but no wild boars or caches of truffles. Our days were filled with painting and every day or so we would venture to a nearby town to visit the market or drive into Siena for art supplies. As far as subject matter is concerned, there was an abundance right there at Tosa; we all seemed to claim specific areas as personal, outdoor studio space and I gravitated towards a quiet, treliced enclosure I later learned was a pigsty for the barn above (actually, if you look at the drawing, the pigsty is towards the left of the building.) I painted away in my little pigsty (il porcile, if you are interested in how it translates to Italian) and I was very happy and prolific there. As is usually typical with my subject material, I passed the scene above many times and paused with interest until one morning it was screaming so loudly that I set up an easel right then and there. The view was from the front stoop of the farmhouse looking directly over to the barn. 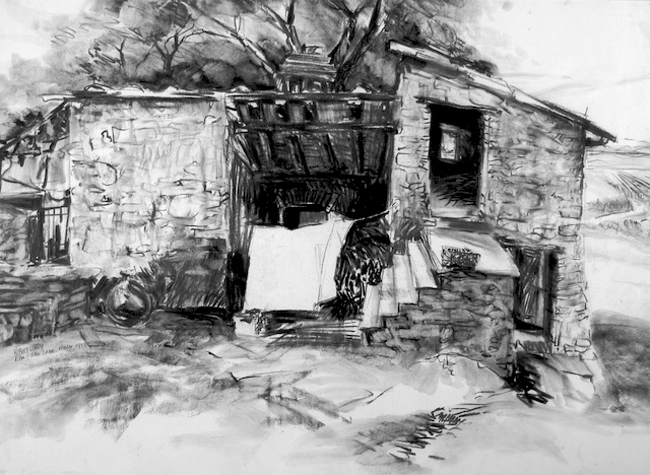 I drew with charcoal on a large piece of paper and used mineral spirits & a brush to get a bit of a wash effect. Vicky is very attached to this drawing and it hangs in our home today. Max, Thank you very much! You are ABSOLUTELY correct! This jarred my memory and I have no reason how I came up with “Sosa”. I’m glad you made the correction.